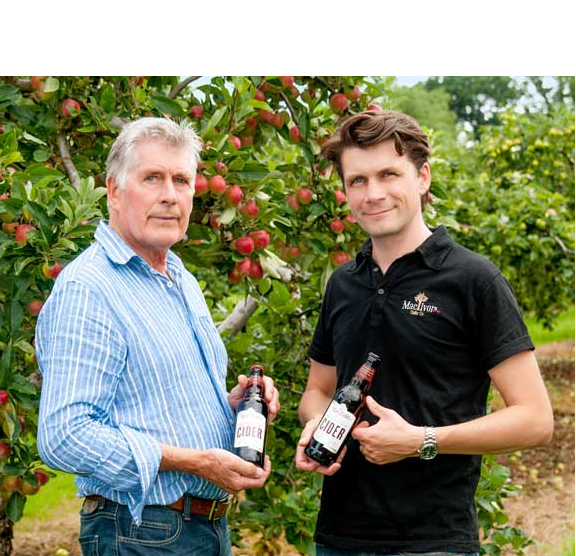 Meet the exhibitor - MacIvor's Cider Co. | Alltech Craft Brews & Food Fair. Who founded MacIvors and when was it founded? I founded MacIvors. We first started work on our first ciders in 2009 and there was a bit of development work over the following years before being officially launched in Ireland in September 2012. So what were you doing for those three years between 2009 and 2012? Cider and cider making and apple growing is a long and slow process. Our family have been growing apples here in Armagh for 160 years and I’m a fifth generation apple grower. Initially we were making cider as a hobby really, so I got those old recipes and started tinkering. So with the first batch of apples being 2009’s crop, I had to wait until 2010 to taste it. So then we went again in 2010 and in 2011 we had a batch to sell at our local market which was very successful. That set us up for our first commercial batch in 2012. How has MacIvors grown over the years? We started off with one product. In my naivety I thought there’d be one product that would satisfy all pallets. The original product was just called MacIvor's and it was a cloudy cider that was 6%. Over time we then developed a number of different products in the range to satisfy a wider number of pallets. We learnt having just one product in 2010 and 2011 in our local market that some people wanted a dryer variant and some people wanted a sweeter variant. At the same time we were doing a lot of work on the variety of apples we grow – there are actually 14 different types of apple in our cider in different quantities. So the period from us releasing our first cider and us launching on to the market was a huge learning curve in terms of how long to ferment and more. So we used this time to help us introduce different ciders to our range. You mentioned that this was something you were doing as a hobby before producing cider commercially – is it safe to say this is a labour of love? Absolutely a labour of love! The motivation for me was to make the most amazing, great-tasting cider ever. The goal became a crusade of sorts to offer more choice when it comes to cider the country as a whole. Where does the name MacIvors come from? My name is Greg McNeece but MacIvor’s is actually my grandmother’s maiden name. So when the McNeece’s married into the MacIvor’s farm and the name was lost we decided to resurrect it because she was a very formidable character. I think it sounds pretty good as well – MacIvor’s Cider – it has a bit of a ring to it! What are you looking forward to most at this year’s Fair? It’s a great event in terms of getting together with other cider makers and brewers. But the most important thing is not only meeting the fans of MacIvor's, but also those people who haven’t tasted it before. We just love seeing the look on their face and then saying ‘That actually tastes of apples!’ I get a huge buzz out of that! We also love introducing cider to craft beer lovers. The Fair gives us an opportunity to showcase what we love to do and have a bit of fun at the same time. Any surprises for us at this year’s Fair? We’ve never had our vintage cider at any festival in Ireland before so we’re going to introduce a bit of that to the attendees. It’s particularly suited to food pairing so we think it will go down very well.